Ever have a time when things in your life were just going well? Maybe not perfect, but it kinda felt like it? The troubles of your past and future were masked by the peace and happiness you were feeling in the present? Then someone or something comes along and lifts you up by the collar, slams you to the ground, and maybe steals your car? That is a massive buzzkill. And that is exactly what Saturday’s match could do to Milan fans, too. After so much joy on Sunday, we face our annoying ex and his rich team filled with talent, many coming back from injuries just in time, too. 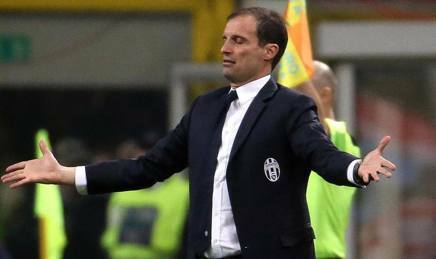 And we know that Allegri will strut in, smile/grimace, scream Dai Dai Dai! for 90 minutes, and a late goal from his random late bench sub will rip our hearts out and leave them on the pitch for dead in front of a sold out stadium. Because he’s just a massive buzzkill that way. Allegri will do that smile/grimace thing extra big on Saturday as he faces the team he nearly ran into the ground with his provincial club-mindedness. But the smile/grimace will be extra big because now he’s got bling for players and two more Scudetti as actual bling. Because it’s harder to take down a team full of champions, even for him. He could sub as late as three matches down the calendar and make them all deaf screaming Dai Dai Dai, and they would still take the Scudetto again this year. I mean they don’t even care about the Scudetto, they’re banking on the Champions League. We’re just a warmdown for their 1-0 win over Lyon on Tuesday. Well, and fodder for their impending Super Coppa win in December, too, of course. So if you’re lucky enough to be in the sold out stadium for this one, you may be spared looking at his face. But those of us watching from TV or devices will certainly be subjected to both his face and long tirades by commentators about what a wonderful coach he is, blah blah blah. You know what’s wonderful? Having the players he has. For example, in their 2-1 win over Udinese last Friday, he lined up Buffon; Benatia, Barzagli, Evra, Lichtsteiner, Lemina, Hernanes, Alex Sandro, Cuadrado, Dybala, and Mandzukic. His subs were Bonucci, Sturaro, and Higuain, and Marchisio didn’t even play in his first callup back from injury. He also didn’t play Pjanic, nor Juve’s young new sensation, Moise Kean. What would that be like, to have that level of player available to choose from? Our bench looks like leftovers from a rummage sale in comparison. That is also not taking into consideration his injury list, which is, of course, lengthy, as we well know. Marchisio should be available, but with questionable fitness levels, so who knows if he will play? Reported as not fit as of this writing are: Mandzukic, Chiellini, our summer fling Marko Pjaca, Asamoah, Rugani, and Mandragora. But those injuries don’t hurt nearly as badly when you have such a deep bench. Not deep at all is Milan’s bench, with Montolivo, Calabria, Honda, Fernandez, and Bertolacci all missing, and Antonelli and Zapata fighting for match fitness. 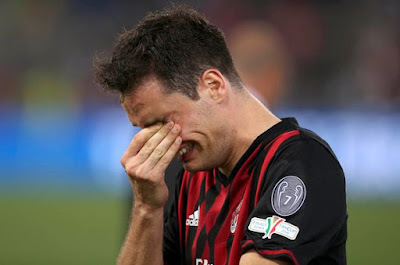 But coming off of the exquisite joy of Sunday’s 3-1 win over Chievo, that list will hardly faze Milan fans. It doesn’t faze me. Because I know that this game is winnable for Milan only through miracles of epic proportions. So I am prepared to lie down, hoist a white flag, and let Allegri’s zebras trample me where I lie. It would still be better than seeing his face and hearing his screams, honestly. It’s not that I have no hope, it’s that I have no desire of ruining the happy bubble that was last Sunday. And 90 minutes of “Dai Dai Dai!” will absolutely do that. 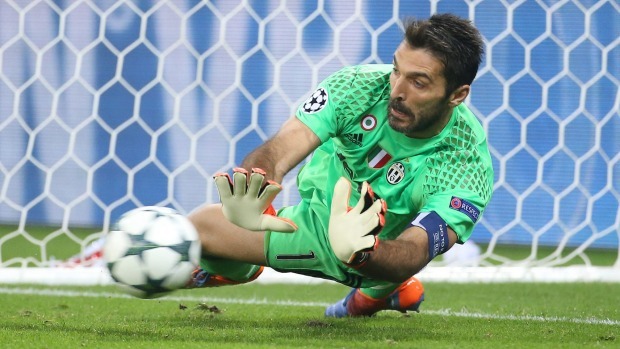 If Buffon brings his “this is what you get for criticizing me” form, how will any of our players possibly score? It’s improbable, but not impossible, that Milan could take points from this game. You already know by now that I don’t begrudge Juve their success. But it doesn’t mean I have to like them winning against us again, either. So I’m going to go in my happy little bubble from Sunday and marvel once again at all of the young players, our position on the table, and more. I guess I’ll watch the game, I always do. But I have this feeling it’s just going to be a massive buzzkill. This match will be shown LIVE on RAI and BeIN in the U.S.